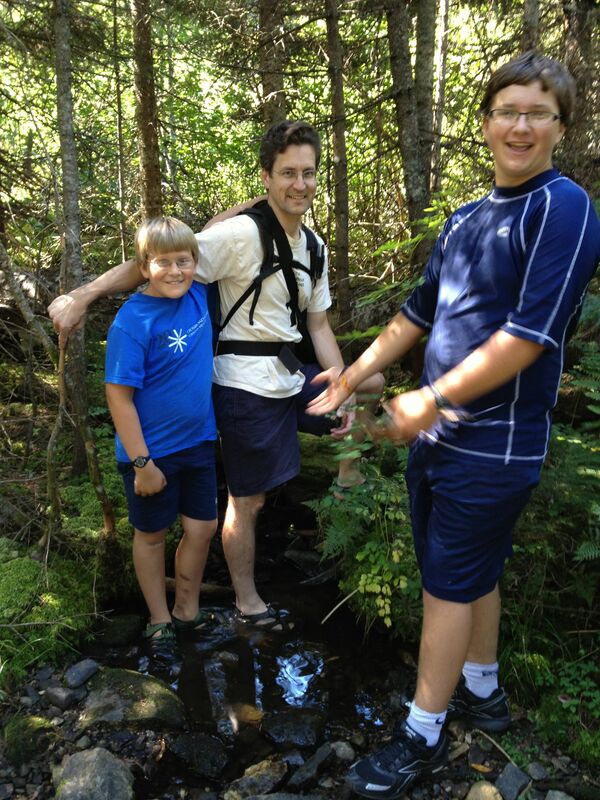 On Saturday we took a gentle hike close to home – indeed, we finished the hike at home. The Upper Valley Land Trust has conserved large sections of Lyme Hill [map], which is the long ridgeline behind our house and overlooking the river. We parked at their new lot on Route 10, the other side of the hill, and followed the nice new trail system [map] to the 1050′ “summit” of Lyme Hill. The kids were grumpy (“why do we have to go hiking! ?”) but on the downhill side the moods cleared and we had a great time visiting Gilbert Cemetery, at the base of the trail where it meets River Road. 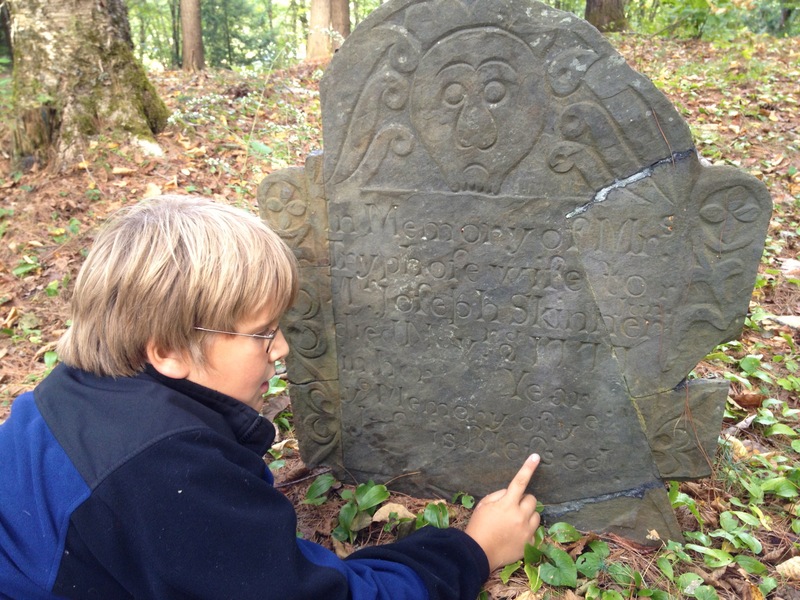 This cemetery is the final resting place of the first settlers in Lyme, and we found gravestones from 1777 to 1784. I posted a few more photos in the gallery. 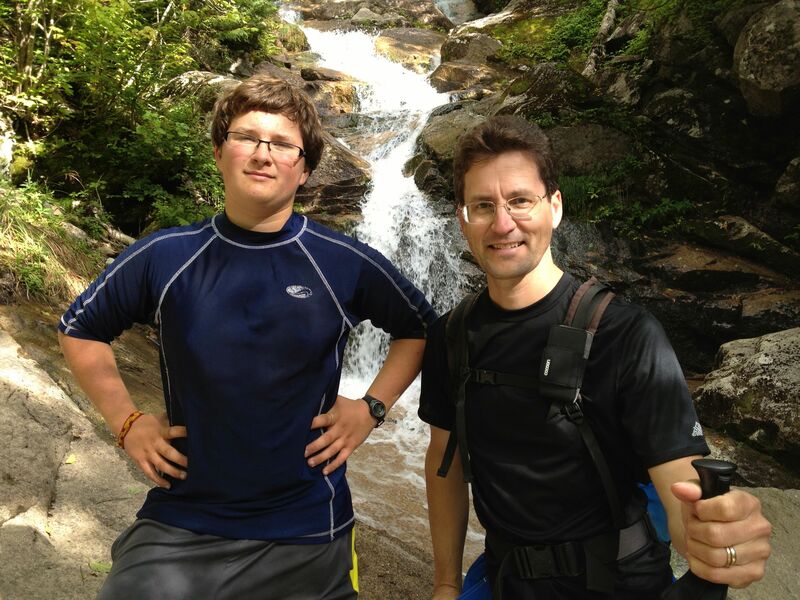 John and I took advantage of beautiful September weather to hike a classic loop in the Franconia Range of the White Mountains (NH). 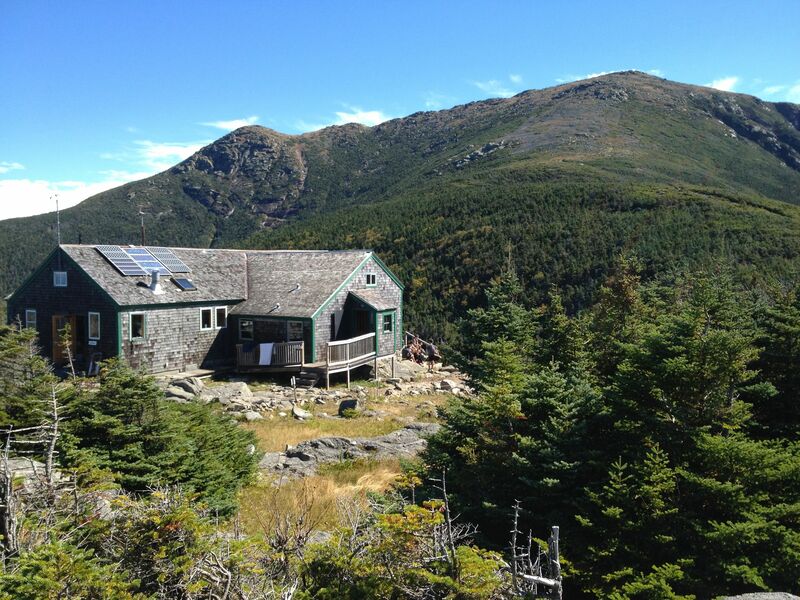 This 8.8-mile loop climbs from Franconia Notch up the Old Bridle Path to Greenleaf Hut, run by the AMC, then to Mount Lafayette. 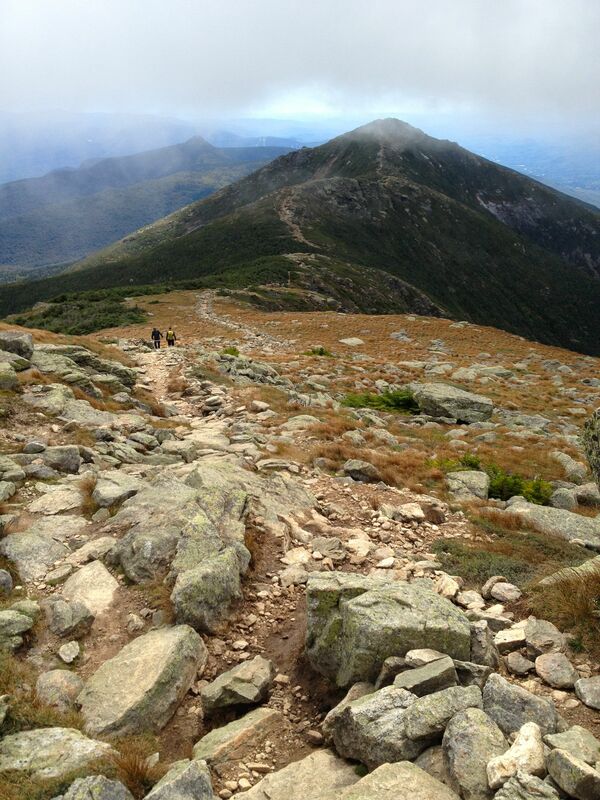 The day was warm and the breeze friendly, with just a few puffy clouds brushing the summits as they passed through New Hampshire. Check the photo gallery. Although our original goal was simply to summit Lafayette and return, we reached the summit by 12:30 and the southbound ridgeline beckoned to us. 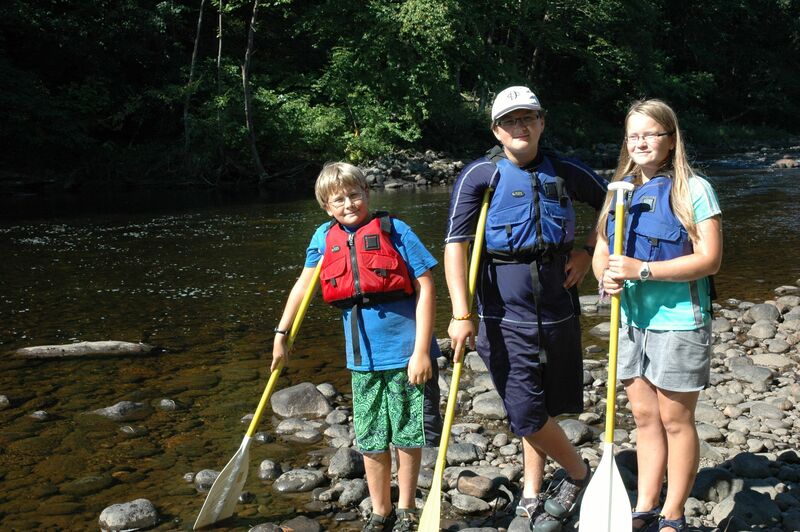 The kids and I spent Labor Day weekend on the upper Connecticut River, visiting its source on the Canadian border, stepping into each of the five Connecticut Lakes, and then paddling one of the first navigable sections from North Stratford NH to Maidstone VT. The weather was gorgeous, indeed, absolutely perfect. Check out the photo gallery! I brought along a kayak and managed to take a brief paddle in three of the four Connecticut Lakes that lay at the headwaters of the river. 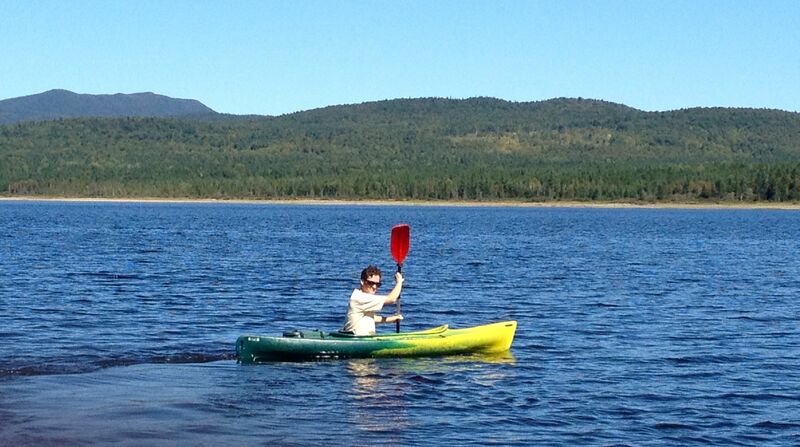 My paddles were so brief as to be symbolic, and the “river” is not really navigable between these lakes anyway. The gallery shows photos from all five Connecticut Lakes: Lake Francis, and First through Fourth Connecticut Lake. The “Fourth Connecticut Lake”, which is the source of the river, lays a few hundred meters from the Canadian border, and has no road access. We drove to the border station, a recently upgraded monstrosity that before 9/11 was no doubt a sleepy unmanned stop sign in the woods. Confused about where to park, we crossed into Canada and asked at the Canadian entrance where to park. He sent us back to the United States. We never legally entered Canada, but had legally exited the U.S.. “Didn’t I just see you going north?” said the US-CBP guard. He checked our passports and told us where to park – next to the huge sign for the Fourth Connecticut Lake; we never needed to cross the border. We hiked to the lake – it’s quite uphill, not feasible to visit by boat, and managed to walk all the way around this pond, er, lake, and to stand in a tiny inlet stream, the source of the Connecticut River. Very cool! for those of us who live along the river. After stopping to visit all five Connecticut Lakes [map] we drove back downstream, stopping briefly at the 45th parallel to marvel that we were halfway from the Equator to the North Pole. In North Stratford, NH we rented two canoes, with shuttle service, because I had only one car (anyway, my Prius can barely carry one canoe let alone two!). There are two great groups that are set up for CT river paddlers, the Connecticut River Paddlers Trail and the Northern Forest Canoe Trail. I found the latter to be far more organized and up to date than the former and we stayed in two campsites managed by the NFCT. That said, the NFCT only covers a small section of the river, but if you check out their home page it is quite an impressive trail! I spent a lot of time, in advance, studying websites and guidebooks, and calling the two canoe-rental places. North Woods Rafting strongly recommended that I avoid the Canaan–to–North-Stratford section that I had planned, because late-summer low-water conditions would be unsuitable. 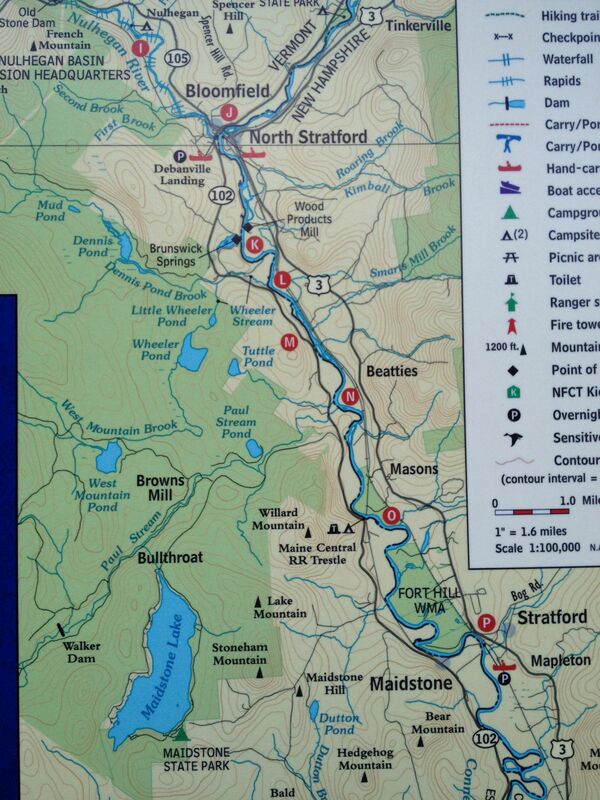 So we did a really short segment, from North Stratford NH to Maidstone VT, because I wasn’t sure what to expect or how far the kids could go, and to add another segment would have doubled the distance. So, we had a laid-back experience rather than pushing for extra mileage. (All the best, I think!) Sure enough, at our starting point the river was so shallow we had to drag our canoes, and we met people who had dragged their canoes for miles through the upper section. 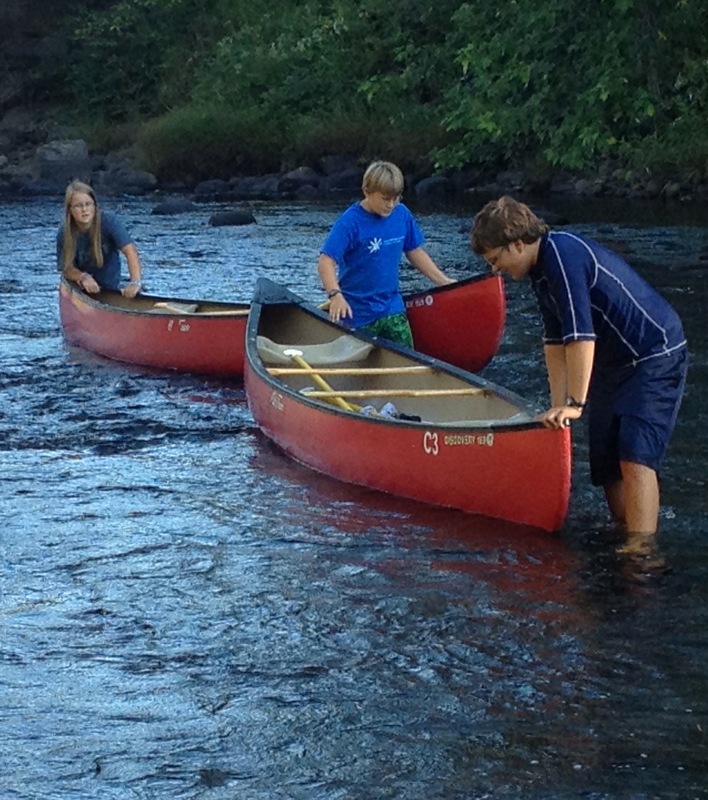 We had just enough “quick water” to be exciting for the kids, and to make our paddle pretty easy. Ready to launch our canoes! Nulhegan river in the background. We had two gorgeous days of paddling, through a largely wild section of river. We zipped through a couple of mild “rapids”. We watched a bald eagle circle right over our heads. We stopped for lunch and a swim. We stayed the night at two wonderful campsites, the second at the site of an old railroad trestle and next to a Vermont corn field. The weather was sunny and warm, and we encountered few other people. I highly recommend the upper Connecticut River. It’s beautiful countryside, largely farmland and small towns, covered bridges and pristine lakes. We only paddled 11 miles of river, in a day and a half, but could easily have done twice that distance in two days. I hope to go back and pick up where we left off, or (in higher water) try the section to the north. I also hope to go back in the winter – I hear the Connecticut Lakes are great for skiing! Meanwhile, the photos will remind me of warm summer days. 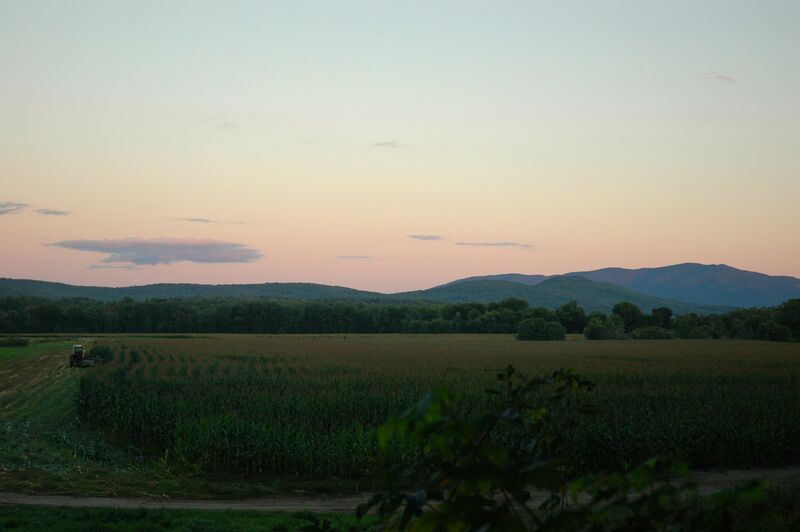 Sunset over Vermont cornfield, from the Railroad Trestle campsite.